really going through, but isn’t likely to share. I loved this book! With my oldest on his way to Jr High in just a few weeks, I was excited to finally have some insight into what in the world might be going on inside his head - LOL. I know that praying for my children every day, especially when at school is so important, but additionally, I also need to know what other ways I can help them deal with the pressures of school and life. 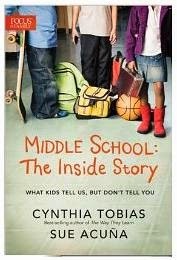 In Middle School: The Inside Story, I found practical ways that I can focus more on their relationships, understanding, and troubleshooting the reasons behind what is sometimes considered awkward behavior. The authors state "many parents are caught off guard by the change in their children when they begin the transition out of childhood and into adolescence." The authors bring hope to those who are frustrated and lost about what to do with their child at this age. I have recently begun starting conversations with my son based on some of the tips in this book and have found that at times it is a good way to get him to open up about what he is thinking and feeling, at other times he just has "no idea" why he acts or responds in negative ways. I am so glad that I was able to review this book at this time, as my son is the first of three children to go to Middle School and go through all the adolescent changes. I hope that as I continue to use this book as a guide and reference that my children and I can survive the journey from childhood to adulthood together and remain close in our relationships with each other. Disclosure: I received free the item(s) mentioned in this post in exchange for my honest review through Tyndale Blog Network. Regardless ~ All my reviews are my honest and personal opinion. I am disclosing this in accordance with the Federal Trade Commission’s 16 CFR, Part 255: “Guides Concerning the Use of Endorsements and Testimonials in Advertising.”.